ORLANDO — What does mechanical obstacle climbing and Frisbee disc launching have in common? Why, nothing else but the annual FIRST Robotics competition of course. Celebrating 15 consecutive years in Orlando, the FIRST (For Inspiration and Recognition of Science and Technology) Robotics program held its Orlando regional competition at the UCF Arena from March 7 through March 9 as 3,000 mechanical wizards battled through the most difficult game FIRST has ever devised. As the skill of the competitors increases and the technological achievements continue to excel, so increases the challenge raised by organizers to those willing to compete in this advanced level of modern engineering competition. This “ULTIMATE ASCENT” challenge is centered on team-built, remote-controlled robots that average around a maximum weight of 150 pounds expected to climb up multiple levels of a metal bar pyramid. In addition to showing off their skills in vertical accent, the robots’ primary objective is to score points by shooting flying discs into raised goals of varying heights and sizes on their team’s side of the competition field. Some of the robots miss the goals and have to make minor adjustments to hit their targets, while others load up, go to predetermined locations and fire a flurry of discs in rapid succession with the utmost precision. Andrew Geltz is a Valencia College student who has also worked for the last two years with “Mekheads” team #1604. This year Geltz is acting as the lead programer and providing additional electrical assistance for his group. “It doesn't take long when it’s done, but then you have to troubleshoot things and it’s a lot of stressful work,” said Geltz. 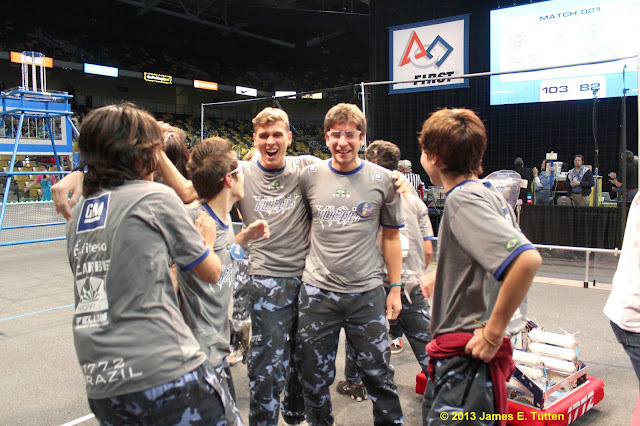 James Austin is a former Valencia Voice editor and a long standing participant in FIRST Robotics, who combined his skills in journalism and robotics to make on-air coverage of the competition a reality. It addition to covering the side stories and first two days of the competition, the group from “The RoboShow” also did a live streaming broadcast during the final day to give extra insight and information between rounds to those watching on the internet. Teams were eventually eliminated as the competition drew to a close. At the end, only six teams aligned as two groups of three remained to fight for the first place finish, earning them placement for the FIRST national finals at the end of April. The six final teams included “Shark Attack” #744 from Fort Lauderdale, Fla., “The Brazilian Trail Blazers” #1772 from Gravatal, Brazil and team “Krunch” #79 from Tarpon Springs, Fla. representing the red alliance. 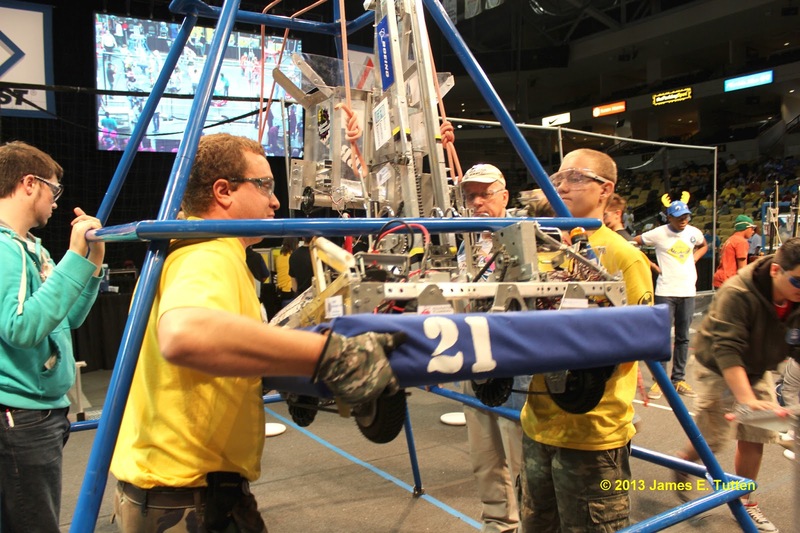 The teams representing the blue alliance were “Neutrons” #125 from Boston, Ma., “ROBOTZ Garage” #4451 from Fountain Inn, SC., and “The Pink Team” #233 from Cocoa Beach, Fla. 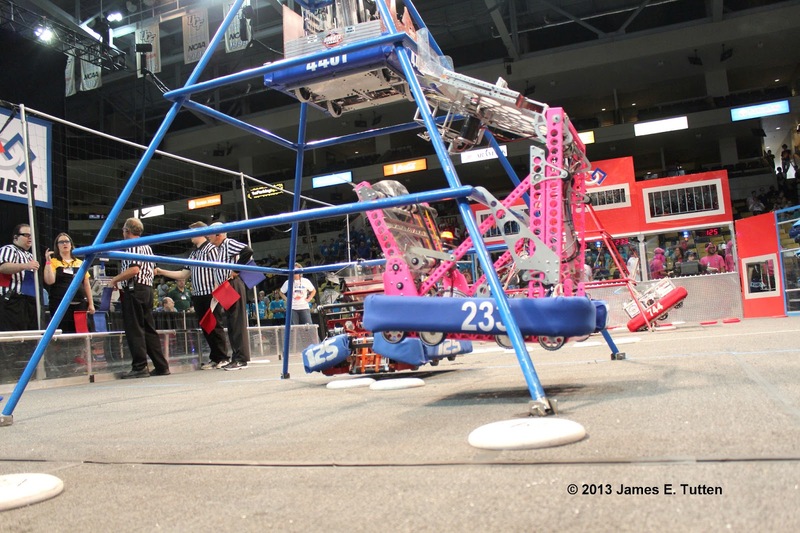 The first round went strongly to the blue alliance led by the veteran “Pink” team and the impressive climbing skills of the rookie team “ROBOTZ Garage.” A come from behind push from the red alliance led to a narrow victory for them in the second round leading to a third and final elimination match to determine the winner. 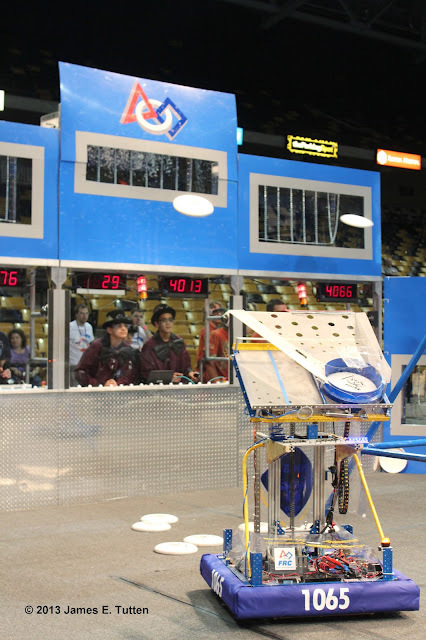 Discs were flying and battle worn robots clashed in defensive maneuvers during the final round of the Florida region, which led to the final point tallies combined with additional penalties identified by the judges. The final score of 103 to 82 confirmed that the red alliance had won, which led to a joyous celebration from members from “The Brazilian Trail Blazers,” who cheered, hugged and wildly celebrated their victory in the middle of the competitive field. Though games like this are often measured by winners and losers, all of those that are involved with FIRST Robotics stand to be rewarded by the millions of dollars in scholarships offered, and the future employment opportunities in technology industries fostered by this organization. Team member from “The Brazilian Trail Blazers” celebrate their victory at Florida Regional.